Rudy: (Jerry Goldsmith) For viewers who consider the 1986 masterpiece Hoosiers to be the sports film with the greatest heart that cinema has ever seen, Rudy presents many solid arguments to reside in second place. The crew of Hoosiers, including director David Anspaugh and writer Angelo Pizzo, reunited seven years later for Rudy, conveying many of the same underdog elements of a very personal nature while ensuring that the sports scenes are restrained enough to maintain the film's placement outside of the stereotypical sports genre. The story of Rudy follows the real-life 1970's journey of Daniel Ruettiger, whose youthful dream of playing football for the Fighting Irish of Notre Dame was countered by the reality of poor grades and marginal athletic ability. With the passion of his heart, however, he managed to be assigned to the practice squad for the team and, in the final game of the season and after becoming extremely popular for his determination, he enters a Notre Dame game for a few plays at the end, sacks the opposing quarterback, and remains the last player to be carried off the field by his team. While the quality of Rudy may not equal Hoosiers, its an equally lovable variant of the same concept, and the role of Jerry Goldsmith's music in both films is pivotal to their success. Goldsmith had been asking Anspaugh and Pizzo for another Hoosiers-like project for years, and while Rudy scratched that itch for both the composer and his fans, Goldsmith would pass away just a year before an opportunity for a third collaboration would present itself in 2005 (The Game of Their Lives). The highly predictable outcome and feel-good subject matter made Rudy a mockery for many film critics to feast on, and although the film has its fair share of faults due to its simplicity, the score is no slacker. Goldsmith's ability to merge the heart of a personal journey with the adversity of a sports environment is masterful, resulting in music that has been used for everything from the Academy Awards and John McCain's 2008 presidential campaign to the National Football League itself. In short, if you're looking for an inspirational orchestral score, there are few that can compete with Rudy. Interestingly, Goldsmith's score has also come under an unfair share of criticism and has experienced a slight backlash due to its immense popularity. One published argument against it many years ago claimed that the score is a softly repetitive, non-complex, and bland piece of music. Others have criticized the score and album for not including enough Irish spirit or simply the theme song for the Fighting Irish of Notre Dame. Most of these arguments, however, come from the mainstream, a mass that doesn't much care for Goldsmith's early 1990's habit of concentrating on character scores like Angie, Love Field, and Forever Young. As for the complaints about a lack of Irish flavor, Goldsmith integrates hints of old Irish influence into the swing of his secondary theme for the football sequences, leading to some general similarities between the rhythmic movement of this theme in Rudy and the far more verbose variant of the same idea to be heard in The Ghost and the Darkness. There is some merit to criticism about Rudy's simplicity; the score is really nothing more than an alternation between its two primary themes. Not a cue on the album passes without either one of the two themes in performance, and as such, the short length of the album is quite welcomed. Both themes have merits, though one easily overshadows the other. The weaker is ironically the title theme, representing the heart of the title character during his journey. The most robust performances of this tender theme exist in "Main Title," which is actually heard over the end titles in the film (the real opening cue is not provided on the jumbled album), and the climactic performance in "The Final Game." While the theme utilizes the same pleasant woodwind performances of a score like Powder, Goldsmith here emphasizes the larger than life aspirations of Rudy with a light choral accompaniment. The choral contribution in the two aforementioned cues is sometimes mixed so conservatively that you can barely determine its presence, and this very slight handling of the fantasy element continues until a full burst at the end of the film. Some listeners will find this theme too sappy for enjoyment, and if you don't typically appreciate Goldsmith's highly personal woodwind themes of the era, then you'll easily favor the more memorable secondary theme in the score. The insert contains commentary from Ruettiger and Anspaugh, as well as a pictorial from the recording sessions. 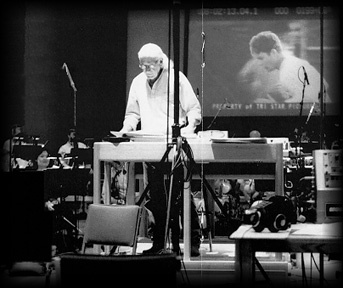 Jerry Goldsmith conducting Rudy, 1993.
or redistributed without the prior written authority of Christian Clemmensen at Filmtracks Publications. All artwork and sound clips from Rudy are Copyright © 1993, Varèse Sarabande and cannot be redistributed without the label's expressed written consent. Page created 4/10/97 and last updated 1/27/08.